This SIAS is opening the cupboards with all the skeleton? Has Hyflux says how much each shareholder, preference shareholders, perpetual securities holder will get in return if the deal with the Indonesian company goes through? If she can plough back the $60 million or more received back into the business, I would salute her. sudoku said: If she can plough back the $60 million or more received back into the business, I would salute her. They don't care about the retail investors. They take their own money and run first. She knows once money in her pocket it will be hard for anyone to try to claw back. Integrity, morality? It is only for the low-middle class society to value. what is good is that she plough back all she gotten and all her assets back and distribute to all shareholders, preference shareholders, perpetual shareholders, i would salute her. $60mil can borrow from banks to start up hyflux 2 to scam ppl money again lo.. why still care abt hyflux 1? toothpick said: They don't care about the retail investors. They take their own money and run first. She knows once money in her pocket it will be hard for anyone to try to claw back. She is a Christian hor. 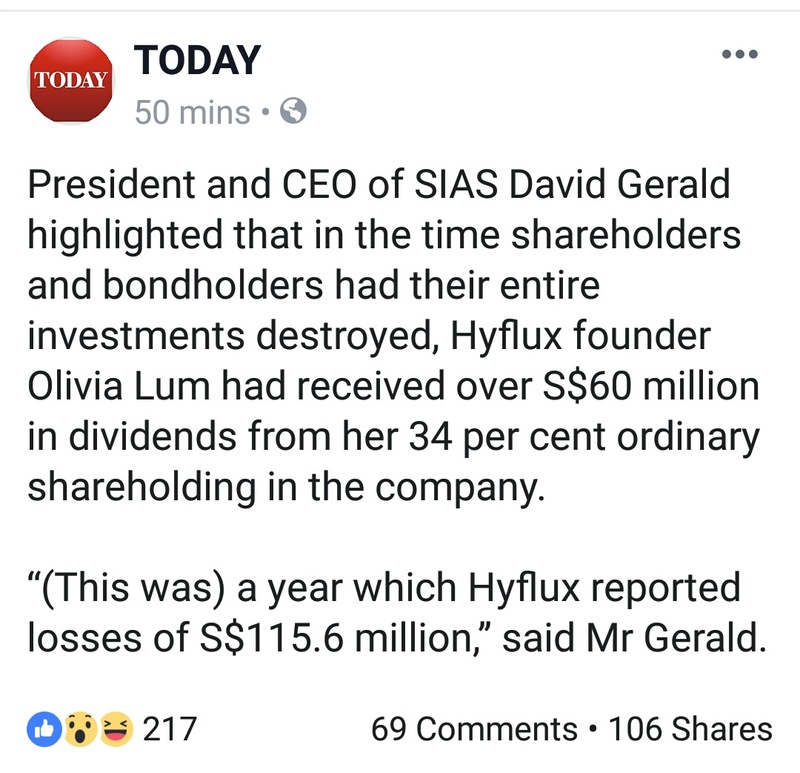 On one hand, she says she pity those retirees who lose alot of their life-savings in Hyflux bonds, on the other hand, she took so much money from the company that cause an even higher lost. WTF!!! Current time: 23-4-2019, 1:08 AM Powered By MyBB, © 2002-2019 MyBB Group.